Several years ago, I watched the Grammys where Melissa Etheridge sang a Janis Joplin tribute with Joss Stone (another favorite artist of mine). Melissa was bald. Completely bald. She had big beautiful earrings, no hair, and her voice was incredibly strong. I remember thinking, “Wow. What an inspiration! 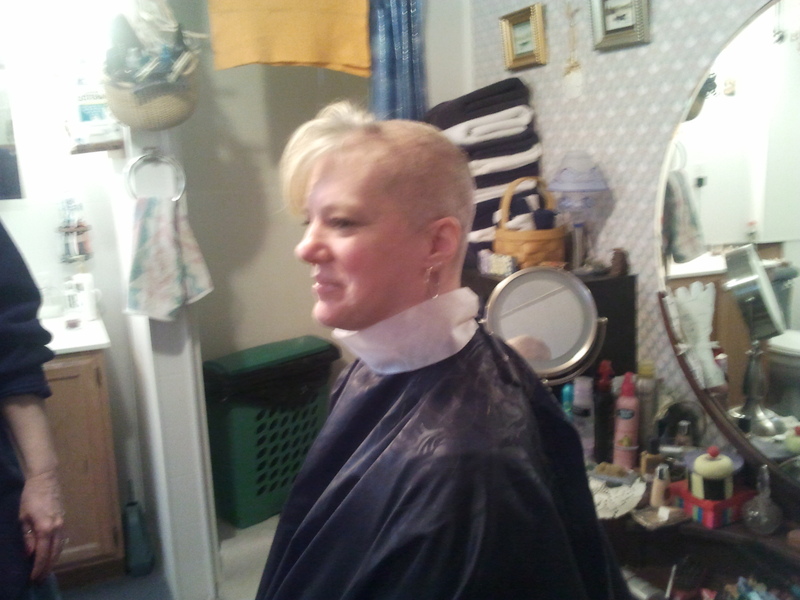 She’s fighting breast cancer and she’s showing that she can still be her amazingly talented self even without hair. She’s not trying to hide it – she’s showing the world that she’s strong and cancer won’t get her.” I found her performance very empowering and I remember telling myself if I was ever faced with cancer, I would do the same – forget the wigs and go bald. A self-fulfilling prophecy, perhaps, because fast-forward to today and I find myself in that very situation. When my doctor originally spoke to me about undergoing chemotherapy, she let me know that Taxol causes hair loss and that it comes out 18-21 days after the first treatment. I am in that “window” now and her words have come true. A few days ago, my hair started coming out in small clumps. Yesterday, I lost a huge amount while taking a shower. 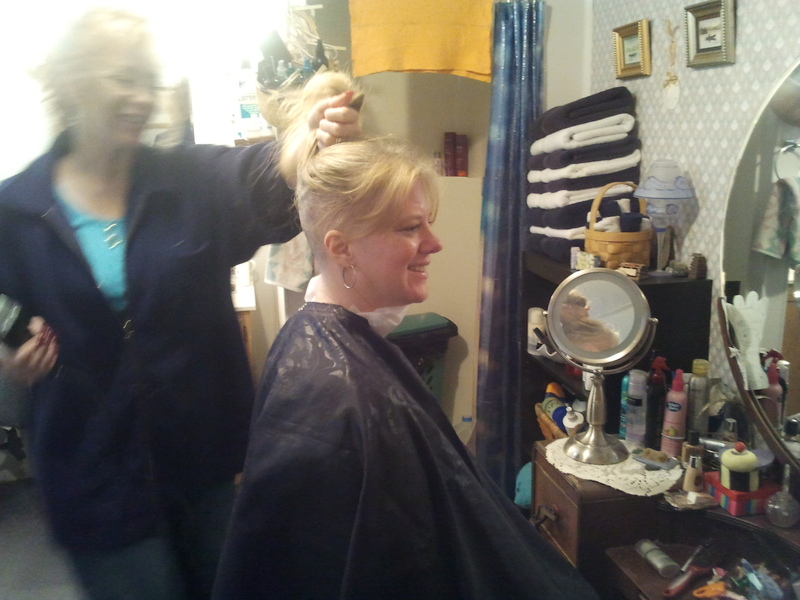 I have taken matters into my own hands – literally – and have decided to shave my head. My pink camouflage scarf - FIGHT LIKE A GIRL! I am o.k. with losing my hair. 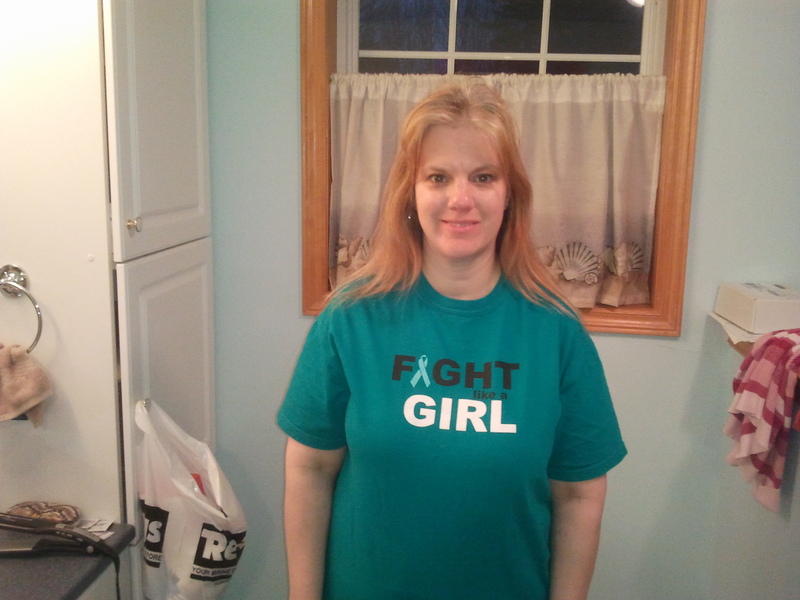 This is part of the journey to beating cancer. Each person needs to make his/her own decision when faced with hair loss. I have nothing against wigs. 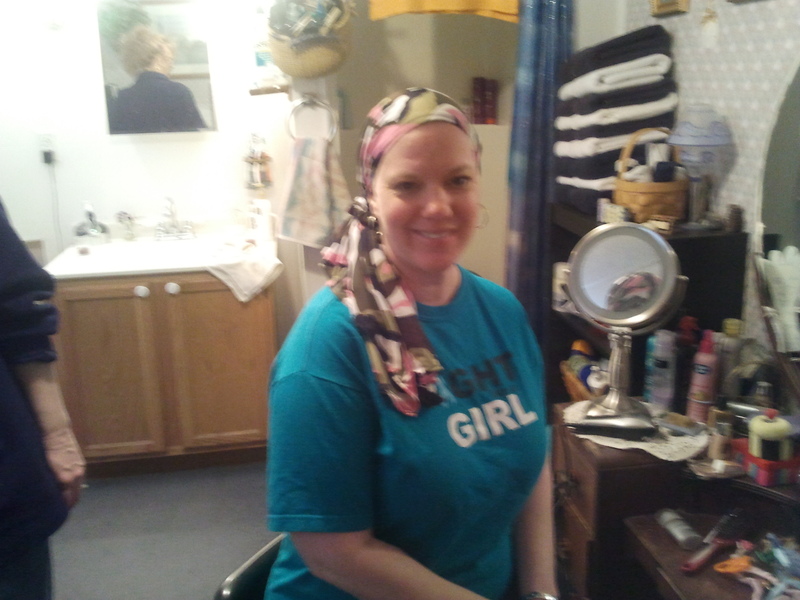 For me, I am choosing not to wear a wig at this time because my scalp is sensitive due to chemo. I may change my mind at some point but for now I’m comfortable going without one. 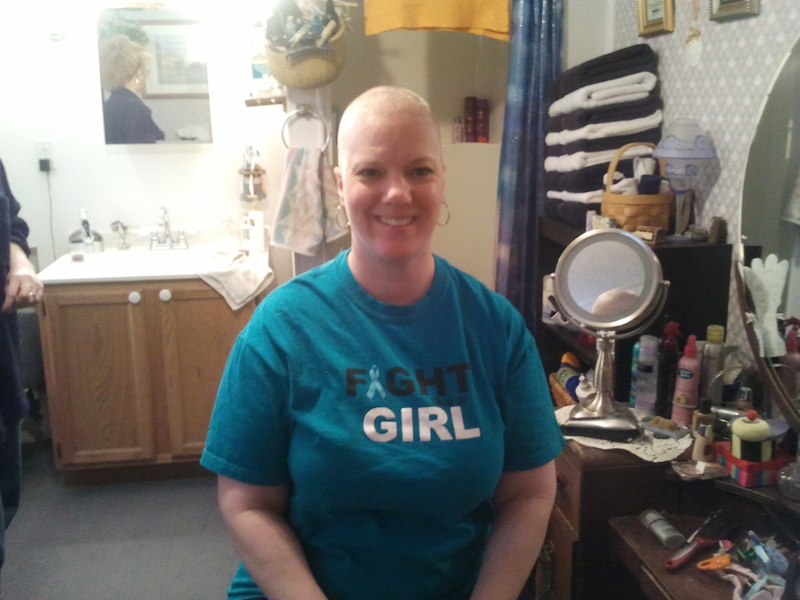 Thank you, Melissa Etheridge, for showing the world that a woman fighting cancer can still be beautiful without hair. Previous The joys of hot flashes Next Spoiled Brat Anyone? Bald IS beautiful! But it does get cold. I wore stocking cap beanies. I matched them to my outfits. I tried on some wigs, but ultimately opted for the natural look, aka bald. I felt stronger by facing it. People complimented my bare head and I grew to love it. Power to you, sister! Thank you, pharmgirl! I have heard it gets cold so I’ve already gotten some scarves. After shaving my head today, I went to Kohl’s and treated myself to some new bohemian-style earrings and some soft winter hats, too. Power to you as well! Thank you for your information and inspiration. It helps those of us who are on this journey as well. LOVE IT! And love the scarf! Now YOU are an inspiration, too!!! Rock on! Thank you, Elektrische! This is my first blog so I’ve not been blogging long. My best friend – who also posts here – has been blogging much longer and has been an invaluable resource to me as I learn this new venture. In my first chemo, since I’ve never had a long-time hairdresser and due to emotional issues, my brother shaved my hair. In my second one, I did that myself. It was hard, but necessary. I also used a wig for the second time since my child was alreday 7 years old and not comfortable with the situation. Anyway, in MY point of view (each person is unique) going bald wasn’t easy. It drained my energy. But, when hair is growing back…it’s like “spring arrived”! and it’s such a wonderful feeling! Thanks for sharing this step with us. Thanking you very very much.